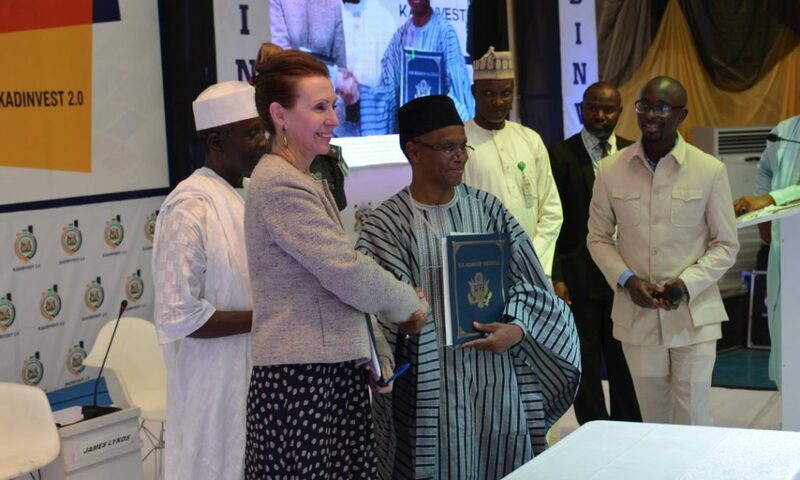 The U.S. government, through the Agency for International Development (USAID), has announced at the Kadinvest 2.0, its continuing support to the economic sector in Kaduna State with the signing of a Memorandum of Understanding (MOU) by the USAID Acting Mission Director Julie A. Koenen and His Excellency the Governor of Kaduna State, Mallam Nasir Ahmad El-Rufai. The ceremony took place on April 5 at Kadinvest 2.0, Kaduna’s annual conference on economic development. The Kaduna State government used the opportunity to reaffirm its commitment to achieving sustainable economic growth by creating mechanisms to make it easier to do business, and aligning its budget to capital expenditure in order to build both human capital and infrastructure. USAID currently supports activities aimed at agricultural productivity, trade efficiency, innovation, power sector growth — including renewable energy and increased energy access for residential and institutional consumers, as well as improved management of water and sanitation services. This MOU will strengthen and deepen activities that are expected to come on-line over the next five years helping to reach a multitude of economic growth objectives in Kaduna State.